Bookings are essential. Prepayment is required for all attendees. RSVP by Sunday 12 August. The Committee of Management has recently reviewed the rules of the association, in light of changes made to Victorian legislation in 2012 relating to incorporated associations. PHA (Vic)’s rules had not been reviewed since 2006. You will find the revised rules here. A hard copy can be provided on request. The rules have been reviewed by a lawyer and are considered to be compliant with both Victorian law and the requirements of PHA. 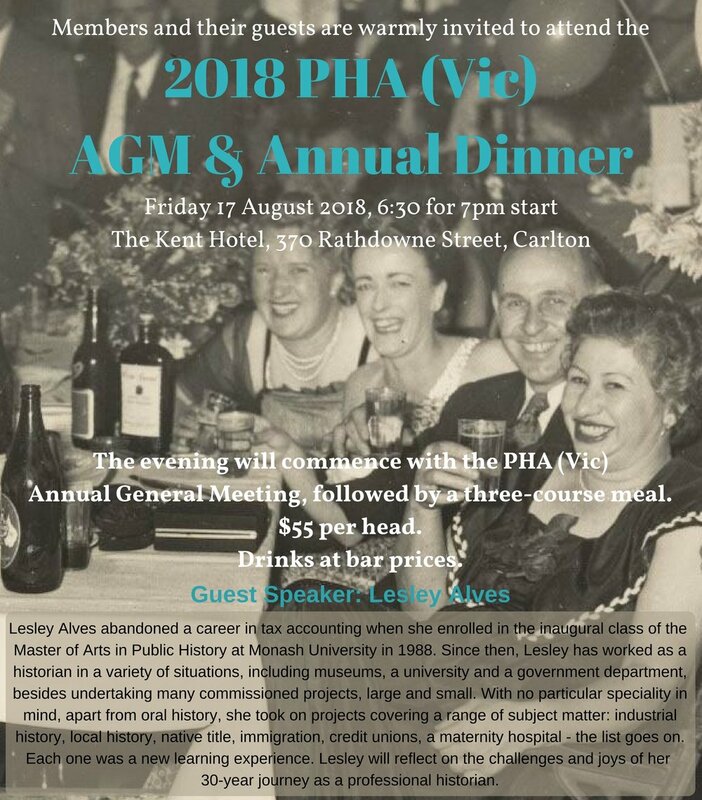 Change of name to Professional Historians Association (Victoria and Tasmania) Inc., the shortened version being PHA (Vic & Tas). Addition of the use of technology, such as using technology to attend committee meetings. PHA (Vic) and PHA (Tas) merged in 2016. The change of name to PHA (Vic & Tas) will ensure that the association’s name truly reflects and represents the membership. It is hoped that this change will also support efforts to expand the membership and promote the practice of professional history in Tasmania. This decision has been made following careful thought and discussion by the Committee of Management, as well as consultation with Tasmanian members. 1. To change the name of the association from Professional Historians Association (Victoria) Inc. to Professional Historians Association (Victoria and Tasmania) Inc.
2. To accept the revised rules of the association, dated July 2018 and circulated to members on 20 July 2018. The Committee is confident in the benefits of these changes for the association, and encourages members to support them. If you are unable to attend the AGM, please send a proxy vote by 16 August 2018.